The Cowboys may have waited until the last possible moment, but they have slapped the franchise tag on OLB Anthony Spencer. Monday marked the deadline for teams to franchise players, a process that was opened up on February 20th. 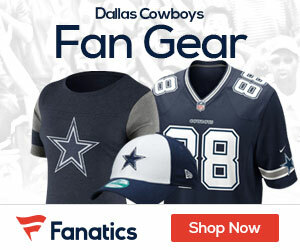 With Spencer being franchised the Cowboys will take an immediate cap hit of $8.8 million. The Cowboys had an estimated $12.5 million in cap space. They do have the flexibility to restructure some deals to open up some space heading into the free agency period. With a franchise tag applied to a player, that player earns the average salary of the top 5 players at his position. 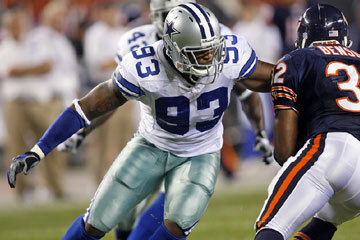 The Cowboys do have the option to sign Spencer to a long term deal to reduce his $9 million cap hit. It is likely that is the plan. Spencer is hardly worth the franchise tag. Since being drafted in the first round of the 2007 NFL Draft, Spencer has not lived up to expectations. Spencer has been playing opposite of DeMarcus Ware, who seems to get all the attention, yet Spencer cannot get to the quarterback on a consistent basis, and often disappears altogether. Spencer has admitted to taking plays off, and have had the coaches, management and fans question his effort. It is obvious the Cowboys were leery of heading into the season with Victor Butler and Alex Albright as the only experienced outside linebackers on the roster. There is not an overwhelming amount of 3/4 linebackers in this NFL Draft. Melvin Ingram (SC) and Courtney Upshaw (Bama) head up a short list of players thought capable of becoming solid edge rushers in a 3/4 system. Both players could be gone by time the Cowboys pick at 14 in the draft. The Cowboys made the safe play in franchising Spencer. Hopefully it is not a decision they live to regret.